I read reviews of this recipe before making it, and most people said to use only 1 egg instead of 2, so that’s what I did. These cakes are delicate, but mine didn’t fall apart. These were okay. I have made better bean cakes before. The ginger-cilantro cream sauce was a nice touch. I made my cakes a little smaller, and I got 7 cakes out of this. 1. Heat a medium skillet over medium heat. Add 1 tablespoon butter; swirl until butter melts. Add onion and garlic; cook 4 minutes, stirring occasionally. Stir in cumin, 1/2 teaspoon salt, coriander, red pepper, and 1/4 teaspoon black pepper; cook 30 seconds, stirring. Remove from heat. Stir in panko and lime juice. 2. Place beans in a bowl; coarsely mash with a fork. Stir in eggs. Stir in onion mixture. 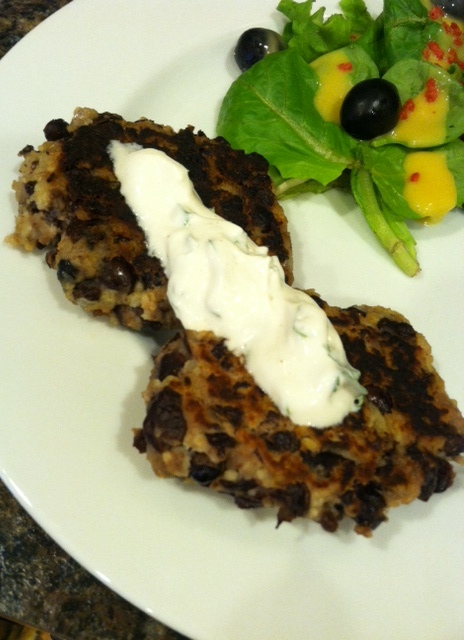 Divide bean mixture into 4 portions, gently shaping each into a 1/2-inch-thick patty. Heat pan over medium-high heat. Add remaining 1 tablespoon butter to pan; swirl until butter melts. Add patties to pan; cook 3 minutes on each side or until browned. 3. Combine 1/4 teaspoon salt, 1/4 teaspoon black pepper, sour cream, cilantro, and ginger. Serve with patties. This entry was posted in main dish, side dish and tagged black bean, cilantro, Cooking Light, ginger, lime juice, onion, panko, vegetarian. Bookmark the permalink.